Before the new version of Blogger, there was a difficulty in adding meta tags to each and every individual posts that you made.You would have had to add the meta tags in the template for each one of the blog posts using the "b:if " tags.Now you do not need to do all that cumbersome work.There is a new method of adding meta tag description to any blog post automatically while writing the post itself.It is almost like a WordPress SEO plug-in for blogger blogs. 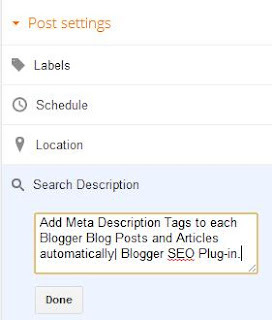 This tool can be very useful in terms of search engine optimization and ranking high on Google search.This will in turn bring you more traffic to your blog, so I advise you to use this Blogger Meta Tag Tool well. 1)Go to Blogger Settings > Search Preferences > Meta Tags. Make this option "Yes" and add some meta tags that are suitable for your blog. 2)Now Go to a "New Post" and you should be able to see the Search Description options in the right hand side under the Post Settings. Now you should be able to see the Meta Tag Generator Option in the "New Post" even if you have a custom blogger template.